The Copenhagen "Climate Change" conference is being driven not by scientists, but by politicians-mainly socialist politicians. One of the influential players at Copenhagen is Dessima Williams- currently Grenadan ambassador to the United Nations and Chair of the Alliance of Small Island States. Dessima Williams is a "climate change" zealot. “It is a cruel irony that without adequate global commitments, the countries contributing least to global warming will be the ones most affected by its consequences... For the smallest and most vulnerable among us, climate change is already here..."
Dessima Williams says we must have a "new paradigm of contemporary living"
Williams' past might give some clues as to what kind of "new paradigm" Williams has in mind. Until recently, Dessima Williams was a professor of sociology and Caribbean studies at Brandeis University. she also served as Grenada's ambassador to UNESCO and to the Organization of American States. Williams is a founder of the Grenada Education and Development Program. She is also co-founder of HAITIwomen and a vice president of OXFAM America. She was a delegate to the World Summit on Social Development in Copenhagen in 1995. She was also co-chair of Massachusetts Action for Women, which was launched to implement the 1995 Beijing Platform for Action of the Fourth World Conference on Women. Behind the "respectable" left facade lies an even more radical core-forged in the poverty and misery Williams witnessed during her childhood in Grenada. Accepted into the University of Minnesota, Williams left Grenada in her teens to study International Relations. Though U.S. based Williams was a supporter of the Marxist-Leninist, New Jewel Movement, which took power in Grenada in 1979. In 1979...The pro-socialist New Jewel Movement, with which she had affiliated herself, overthrew the dictatorial government and took power. In a brief phone call, Williams was assigned the central role as Grenada's ambassador to the Organization of American States. In a whirlwind of meetings and travel, she became the government's representative to Congress, the media, the U.N., the World Bank and UNESCO. Working alongside Grenada's prime minister and foreign minister, she helped to manage Grenada's foreign relations while seeking economic support from bilateral and multilateral donors. Williams says.."I understood the possibility of change." Developing countries stuck together in the UN, she explains, and she was active in a non-alignment movement with Mexico, India, Cuba, Ghana and Yugoslavia. " Her role became "to translate Grenada to the world and the world to Grenada,"
In 1983, havoc broke loose among the government of Grenada. The pro-Soviet/Cuban Prime Minister Maurice Bishop and others were killed by more even more radical members of their own party. U.S. forces invaded the country to restore order and presumably to stop further Cuban/Soviet encroachment into the region. At this point, Dessima Williams, left Grenada to finish her graduate studies in the United States. During regular trips to Grenada, Williams was involved with the Maurice Bishop Patriotic Movement faction, which remained active on the island. Williams also became a leader of the Communist Party USA breakaway group, the Committees of Correspondence for Democracy and Socialism (CCDS). She is listed at above left as a member of CCDS's 2002 advisory board. Incidentally, US President Barack Obama has a long history with CCDS. The Timuel Black also listed at left has been in contact with Obama since since at least 1992. 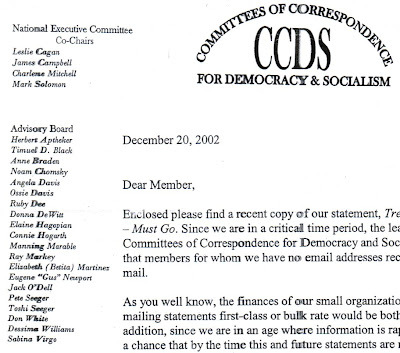 In 2001 Williams was honored by more of Obama's Marxist friends , Democratic Socialists of America (DSA). The Boston branch of DSA gave Dessima Williams their annual Debs-Thomas-Bernstein Award. Dessima Williams' moving and inspirational speech recounted how a young graduate student in the U.S. came to find herself appointed UN Ambassador from Grenada's new revolutionary government. Reflecting on the bitterness and sorrow of seeing their promising movement collapse, leading to military coup and ultimately a U.S. invasion, Dessima affirmed her conviction gained from experience that "Socialism without democracy cannot survive, but ultimately, neither can democracy without socialism. The real question is, can Western style democracy survive, with people like Dessima Williams and her comrades, deciding the fate of our world in Copenhagen? Very nice information. Thanks for this. Please come visit my site Business Services Web Directory Of Milwaukee when you got time. Very nice information. Thanks for this. Please come visit my site Milwaukee Directory Businesses when you got time. I really liked your blog! Please come visit my site Madison Business Phone Listing when you got time. I really liked your blog! Please come visit my site Denver Business Directory when you got time. You're an idiot.... Access to the Internet doesn't always mean that when you write it is at all intelligent. I suggest you spend less time writing about things you obviously do not have a full grasp of and more time educating yourself about things of intelleluctual merit . Marxist? Socilasm? Heavy terms for someone who barely knows their meaning. Look in the mirror mon ami and ask yourself if you're doing something you're proud of?